It is no secret that Central has a very active and very talented performing arts department. The music and drama department have been around almost as long as the school, and their consistent winning of awards demonstrates their talent. New to the drama department is the “Improv Team,” which was formed during the 2016-17 school year. Improv Team is a group of performers who rehearse the skills of “Improv,” which is acting without a script. The team is usually given small details such as a location or a prop, and together they have to make a scene that makes sense and is entertaining for the audience. 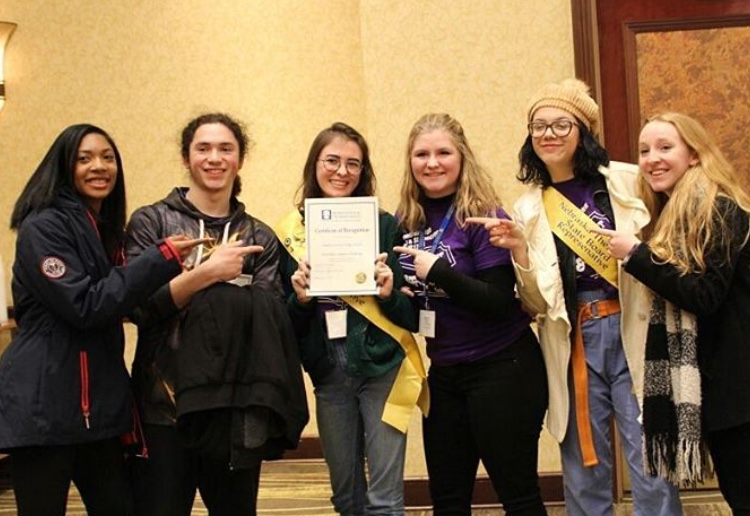 This year, the Improv Team competed at the International Thespian Society in Lincoln. “ITS” is an educational honor society for students interested in drama and the performing arts. Both public and private schools are members or “troupes” of this society. Over 30 different schools from across the state were represented. After a weekend of competing, Central’s team placed 1st. The Improv Team has six members and two alternates. Riley Kessler is the captain, with Bria Gilmore, Lydia Baum, Romyn Peterson, Henry Winseski, Lauryn Niemants as her teammates. The groups alternate is Lily Weak. The team is probably doing well in competitions because of their joy in what they do. “Being on Improv Team has definitely been the best part of my year so far,” team member Baum says. Baum is one of three juniors on the team. At the International Thespian Society festival state competition, the team had to perform their Improv bits against other schools. The completion takes place yearly, with multiple schools in attendance. There is no time to plan anything out, which makes performing much more difficult. Throughout the competition, there are workshops where students can learn and develop their skills. “The competition was really stressful because there nothing can be prepared, so you just have to hope you’re funny enough and a strong enough team member to get through it,” Baum says. To see Improv Team perform live in action, they will have a performance during the 2018 Roadshow. They feel that placing first in state has only strengthened their team, and they will keep progressing. “If you need an autograph from a particular member of the team, just ask us, celebrity status is an adjustment,” Baum says.